The reason I didn't have the gumption to post that Madame Picquery could be a double-agent for Gellert Grindlewald is because of the (limited) information provided by the Pottermore website for her character, which, quite frankly, makes her out to be quite a saint: her first name, "Seraphina," after all, invokes the fiery Seraphim angels, the highest choir of angels worshiping God at all times. She was the only student at Ilvermorny to be chosen by all four houses for crying out loud, and she is, of course, Madame President, the highest ranking magical official in North America. So, yea, she's got tremendous status, presence and reputation, in other words, the perfect cover. Remember, Tom Riddle, aka, Lord Voldemort, was also an excellent student and offered top jobs at the Ministry of Magic when he graduated from Hogwarts, so we'll examine how Madame Picquery's costumes reveal what she's trying to hide. I haven't posted on Fantastic Beasts and Where to Find Them; I haven't posted on a lot of films lately, but I will be open, honest and truthful: even if I had posted on the film, I knew I didn't have the guts to post on the theory that kept hitting me over the head regarding Madame Picquery, the President of the Magical Congress of the United States of America (until someone else finally suggested the theory first), namely, that she's a double-agent for Gellert Grindlewald (Johnny Depp). "Do you really think you can hold me?" Grindlewald asks Madame Picquery when he's revealed at the end of Fantastic Beasts and Where To Find Them; almost without blinking at the astonishment of what happened to Percival Graves (Colin Ferrel) or that she has been trusting Grindlewald all this time, Madame Picquery hardly seems "picqued" at what has happened in this extraordinary scene. After Credence has been "killed" and "Graves" starts battling the same wizards, he doesn't strike or attempt to strike Madame Picquery, why not? If she is really the enemy, shouldn't he have targeted her first? But she does completely unscathed. 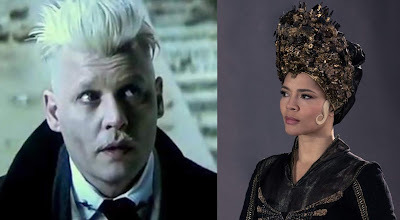 Both Grindlewald and Picquery have unnatural hair colors, Picquery because she's black, or at least of partial black ancestry, and her hair is an unnatural platinum blonde (even for Caucasians, that's a rare hair color) and Grindlewald's is nearly white, shaved on the sides and back and standing straight up on top. Throughout the film, Picquery wears elaborate head-dresses to cover her head, symbolically conveying that she--at best--keeps her thoughts to herself or, at worst, is hiding what she truly thinks, but the similar, unnatural hair color suggests that he has unnatural thoughts, rather like the unnatural experiments which he conducted that got him kicked out of Durmstrang school. His similarly bleached mustache reveals that he has an appetite (the hair above the mouth symbolizes appetites just as the mouth does) for the unnatural. The parts of his head which are shaved shows that he has removed those parts of his thoughts that don't serve him (such as mercy, equality, trust and compassion), while the hair standing straight up demonstrates "high thoughts," like, "Some are better than others and should be higher than others," i.e., wizards over muggles; then there are the tall head-dresses of Picquery, which suggests that she has "high thoughts" reflecting Grindlewald's. Now, I know what you're thinking: Picquery is the one enforcing the No-Maj rules and the Statue of Secrecy the most, but I ask you, is that not a part of the plan? By enforcing the rule so much, even to the point of absurdity, is she not demonstrating--to the way of Grindlewald's thinking--that it's burdensome and enslaving for the Wizarding community? In other words, they are forcing it to demonstrate that "The old ways serve us no longer." In this confrontation pictured with the unmasking of Grindlewald, Picquery does order one of the attending wizards to disarm Grindlewald, so doesn't that prove that she is not on his side? Well, knowing how powerful he is, and how powerful he then demonstrates he is (if it weren't for Newt), why doesn't she disarm him herself? Doesn't she give Grindlewald warning of what she's about to do, i.e., have him disarmed, so he can prepare himself to defend himself? Wouldn't she be the more powerful wizard to go against him and thus, stop him, if that's what she really wanted to happen? We get the idea that Grindlewald would have easily been able to escape if it weren't for Newt and Tina, which may be the reason Picquery limits Newt's ability to travel in FB2 and sends Tina on foreign assignment, so they are literally out of the way and Grindlewald has a better chance of escaping. We know that hair--or anything atop the head--symbolizes or manifests the thoughts or thought process of that character because our thoughts originate in our head; Seraphina Picquery consistently wears something atop her head throughout the film,... meaning,....? Exactly, we don't know what she's thinking because she's keeping her thoughts (her hair) to herself,.... until, we see Grindlewald unmasked. When Newt's spell dissolves the persona of Percival Graves (Colin Ferrel) to reveal Grindlewald (Depp) we see Grindlewald's bleached hair and realize,.... it matches the curls on the side of Picquery's head! The image of Grindlewald on the left is from FB2, and the one on the right from FB1. What I would like to point out is the similarity in their costumes: the long, dark coat, the vests, the high collar on their shirts and darker outer clothing with the lighter colored shirts underneath. 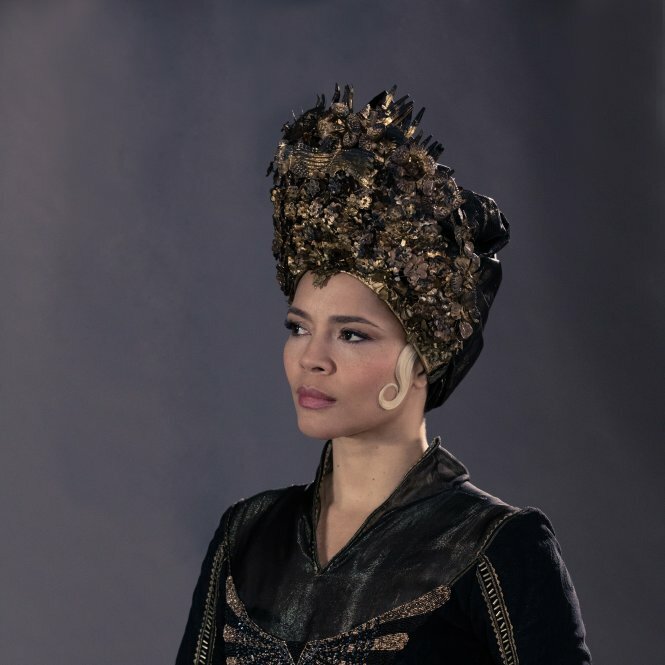 Once again, we see Picquery wearing a tall head-dress covering her head entirely except for the two curls on either side of her face. Picquery wears rather masculine attire in this shot but the dark clothing of both suggests their identity as "dark wizards"; the importance of their vests accentuates their torso. The torso is a difficult symbol with which to grapple, but it's where the vital organs are located, so when a character wears a vest open, for example, it usually is meant to draw attention to elements of that situation that the character finds vital to their own being; when a character has a vest buttoned--as both characters do in the images above--it suggests the opposite, that they are "closing themselves off" from the situation so that which is vital to them will not become contaminated by the events taking place. An counter-example of this is during the reading of Dumbledore's Will in Harry Potter and the Deathly Hallows Part 1 and Harry wears a vest which is completely unbuttoned; the reading of the Will is vitally important to Harry and the events to follow; Ron, on the other hand, has one button on his vest still buttoned, suggesting that he isn't taking in everything he should be, and he's not, because he won't understand the meaning of the "putter-outter" until the next film. Tellingly, it's the button closest to Ron's heart which remains buttoned, meaning he's keeping the Will-reading out of his heart, but it's exactly what touches his heart that will re-unite him to Harry and Hermione. Consulting her profile on Pottermore, it reveals that she uses a wand with a Rougarou hair-core wand, swamp mayhaw wood, made by Violetta Beauvais" ("Rougarou hair" comes from a wild dog-headed monster that prowls the swamps of Louisiana, and [if you scroll down a bit] in the article on magic in 1920s America, the article reveals that "It was often said of Beauvais wands that they took to Dark magic like vampires to blood," which is exactly what Picquery carries, and even mentions Picquery in the next sentence. Violetta Beauvais, the wand maker, has a revealing name: "Beauvais" is a small town in France, and "Violetta" of course invoked the color Violet, a shade of purple; so what? One of the two symbolisms for purple [and shades of purple] is that of royalty, because purple was such an expensive and labor-intensive dye to produce, only royalty could afford to wear it. So, what does this mean? I would like to suggest that JK Rowling conveys the meaning of European ["Beauvais" being a town in France] wizarding-aristocracy (royalty implied by the name "Violetta") being spread in America which was generally unknown [the status of being "pure-blood"] but being spread by use of Beauvais wands and those using them). Grindlewald is, of course, a "dark wizard" who employs the dark magic he learned at Durmstrang ("Dark Arts" is even listed as his "Hobby" on his profile page) and Picquery's wand has a natural inclination to the dark arts which suggests, that since the wand choose her, it must have known that she herself must have such an inclination she would be willing to act upon to express the true power of such a wand. If, after all the notes detailed in the captions, you still aren't convinced that it's at least a possibility, remember, that makes the most effective cover (she's unimpeachable as far as the Pottermore website goes, her first name, again, meaning "fiery winged angel") but check out what "Picquery" means: "Unique, visionary, different," and I think those are words which perfectly describe Grindlewald, and potentially reveal who Madame Seraphina Picquery really is. "Pure-blood families, who were well-informed through wizarding newspapers about the activities of both Puritans and Scourers (Salem Witch Trials), rarely left for America. This meant a far higher percentage of No-Maj-born witches and wizards in the New World than elsewhere. While these witches and wizards often went on to marry and found their own all-magical families, the pure-blood ideology that has dogged much of Europe’s magical history has gained far less traction in America" (From History of Magic In North America, Pottermore). This is an important bit of invented history of Rowling, as she goes out of her way to dissociate American Magical problems from those of Europe (and which plague the pages of all Harry Potter books). With such effort taken, we also see her creating the schisms which will erupt, sowing the confrontation for the next four Fantastic Beasts films: No-maj vs the magical, wizarding world. A further example of such pure-blood and European "influences" can be seen in Madame Picquery's chair for MACUSA (behind her in the upper-left, corner) and the striking resemblance it bears to the Coronation Chair (on the right side) used by muggle kings in England, suggesting that the wizarding world is superior to the non-magical world, even in North America. There are two striking features about Picquery's costume in this image. First, the sleeves (click on image to enlarge): she has two of them on each arm. We know that the arm symbolizes a person's strength, while a person's hands symbolize their honor. That she has two sleeves suggests she has "two sources of strength," such as her top-position at MACUSA and her role within Grindlewald's plan for a new world order. 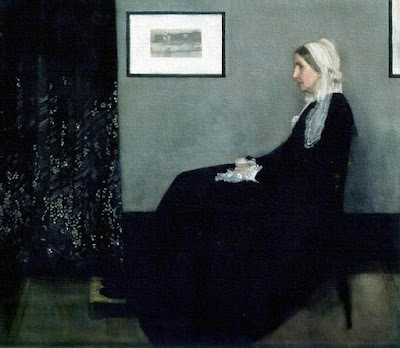 That her hands are interlocked suggests her dual-sense of honor: while appearing to enforce the strict secrecy laws of North America, she is also doing so in order to bring about their downfall (consider, for example, her order to Tina Golstein to stop following Mary Lou Barebone; why? Because Barebone would be allowed to advance the New Salemers agenda that would advance the confrontation between the No-maj and magical world that would require action, rather than maintaining the century's long peace they have enjoyed). Her hands are also interlocked and held close to her stomach. The stomach generally symbolizes that which we have "digested" and taken in to make a part of ourselves, but with a woman, it can also indicate that which she is about to "give birth to" (and no, I don't mean this in a biological sense--I am not suggesting her and Grindlewald have a sexual affair going--rather, Picquery is in the gestation period for "giving birth" to her part of Grindlewald's new world order). Last but not least is the decorative emblem over her chest, where her heart is. The design mirrors the logo design for the Wizarding World (bottom left corner) but it's upside-down, it's even the same color as her dress. This suggests that what's close to her heart (over her chest) is to turn the wizarding world "upside-down" with Grindlewald's revolution. 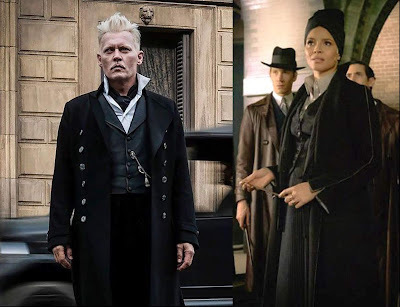 As I started out this post, I wrote that I didn't initially have the guts to mention this theory of Picquery being Grindlewald's agent until someone else did first, and now with the last trailer having come out, it has begun circulating that Picquery may not only be a double-agent working for Grindlewald--and therefore making it possible for Grindlewald to go "undiscovered" after hacking the identity of Percival Graves--but she may actually be the one who engineers Grindlewald's escape (it's been confirmed that Grindlewald is held in prison in the US for several months; it's being speculated that Grindlewald will be relocated to Germany/Europe for trial for his crimes there, and during that re-location effort, he makes his escape). Fantastic Beasts: The Crimes Of Grindlewald opens November 16.